Are you praying for those who work in missions? 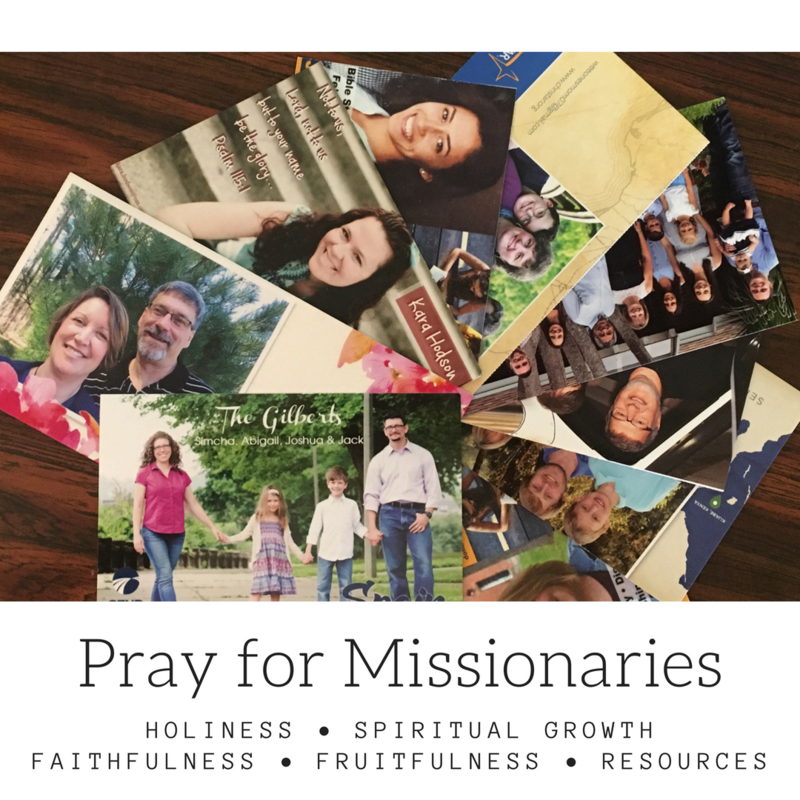 Every week my wife and I take a stack of prayer cards for various missionaries and we pray for those who are spreading the Gospel and making disciples in Western MA and all over the world. Missionaries need your prayers for holiness. God has called Christians to be holy because He is holy. That includes missionaries. Being a full-time disciple maker does not mean that we have achieved sinlessness. We need the grace of God both to see our sin and to repent, reject, and run from it into the arms of our loving Father so that we can become more and more like His Son. That they would not only know what God’s word says, but to put it into practice. That they would grow in discernment by constant practice in distinguishing between good and evil. We grow spiritually as we seek God and His righteousness. We grow spiritually as we seek God and His will in the Word of God. We grow spiritually as we draw near to God in a lifestyle of worship. Missionaries (and pastors too!) can easily get overwhelmed by trying to help others grow in the faith when they begin to neglect their own growth. That they would seek God first, not allowing anything to distract them from their own relationship with God, not even ministry. That they would be committed to a lifestyle of worship, prayer, and study of the word. That they would have the wisdom to know when to say no to new commitments. For each missionary to have someone who can act as a spiritual and accountability partner. Like being a pastor, being a missionary can often be a very autonomous position. Yes, pastors and missionaries are accountable to various groups (elders, the mission organization, etc), but generally, there is no one standing over you to make sure you are making the best use of your time. Also, missionaries can sometimes be discouraged because we do not always get to see the fruit of our work in the timeline that we would like (or we may never get to see what it is God has done in some cases). That can be discouraging and lead to apathy. Battle on behalf of missionaries (and pastors!) so that this does not happen. That missionaries would make the best use of their time by saying no to unprofitable practices or things that distract, and that they would be diligent about doing the work of evangelism and discipleship. That they would not become discouraged by the difficulty of ministry, but would instead entrust themselves to their faithful creator while taking joy in the work to which he has called them. For frequent opportunity to speak the Word of God boldly into the lives of unbelievers. That the Holy Spirit would draw people to Christ, and that missionaries would be sensitive to his work in the lives of others. That each missionary would effectively teach the word of God to other believers, making disciples who make disciples. Simply put, if missionaries can’t afford to live or do the work of ministry then it won’t get done. This is not a matter of not trusting God for resources, it is a matter of God’s people being faithful with their time, treasure, and talents. God works through his people to do his will. It is a truly humbling thing to receive support, encouragement, and partnership from other believers. Every time someone begins to support a missionary financially, prayerfully, or in some other practical means, they are being used by God to answer the many prayers missionaries have prayed. God uses both those sent as well as those sending them to do his will. What a great partnership that is! That other believers would faithfully lift up missionaries in prayer. That missionaries would be fully funded. That other believers would answer God’s call to “work the harvest” and come alongside other missionaries. I and the rest of the Gilbert family would be honored if you would pray for us on a regular basis. Would you please consider partnering with us by praying for us weekly? If you would like a prayer card to use as a reminder, we will gladly send you one. You can sign up as a prayer partner by visiting our ministry page at www.send.org/jsgilbert. Once there just click on the button that says, “Join Prayer Team.” You can also reach us on our Facebook page at fb.me/SendJackandSim.